Necklaces have had their own importance in jewellery designs. They give the neck an adjacent look. 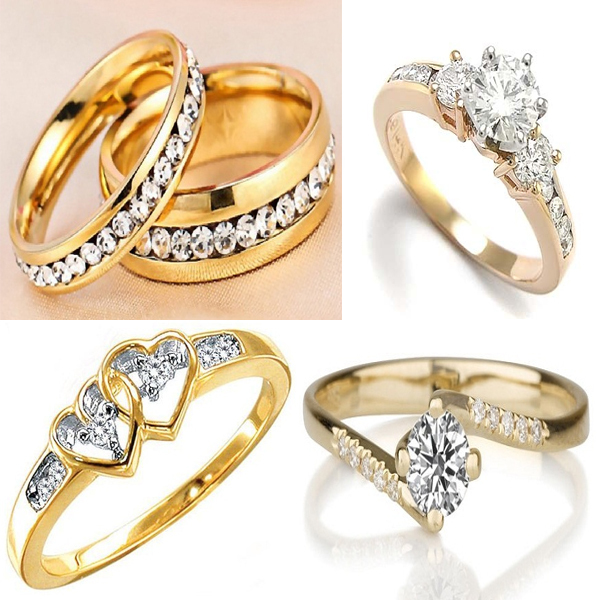 When studded with lovely emeralds, diamonds, rubies, pearls, and cute charms they always get a small place in the hearts of the women. Gold necklaces have always given a new look with the amazing designs. But with the change in fashion, the necklace designs have also changed from heavy gold ones to cute and charming chokers. 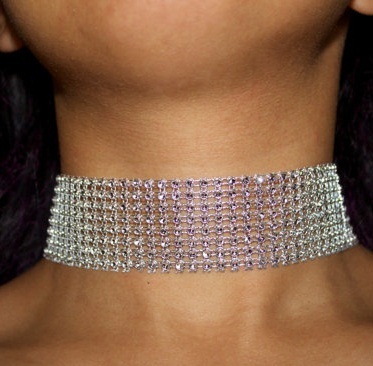 Choker necklace came into existence in the late 90s to give a new fashion trend. They can be of gold, silver, or simply of a tattoo design. In any form, they give a glamorous look to the girls who hate those heavy necklace. 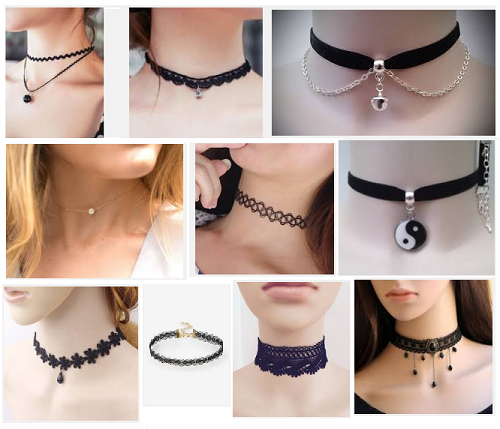 Let’s have a look at some amazing designs of choker necklaces. A new choker design with a western look is a amazing combination of black and white. 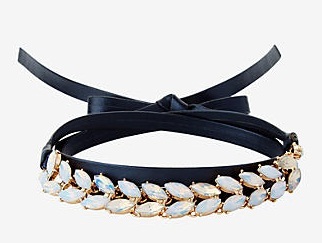 The black choker necklace is studded with a strand of white stones in leaf shaped. The strand is given a different string so that bit can be tighten if required. It gives a lavish touch to the western wear specially in parties or day out. A simple choker design with black strands and a cute charm gives a sophisticated glance for a routine wear on every outfit. The design is composed with two black strands which are connected with a cute charm of the design of the sun made in silver. 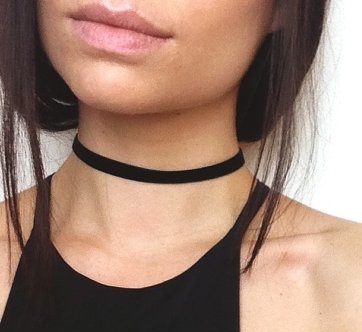 You can also give a new look to the choker by pulling one strand of it making it longer than the other. Want to have a simple but sensual look for ball nights on short gowns! Take a look at a simple black choker necklace design made out of velvet. All it contains is a black strip tied on the neck firmly. It gives a sensual look on black gowns. Also different colored velvet chokers are available to select the one matching your dress. Want an opposite combination to wear! Want a heavenly look! Try a strand made with the sun and the moon charms. The design has two strings. 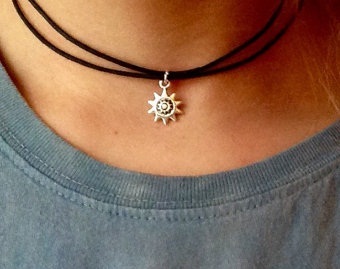 One is given a sun charm, which is worn above the string having the moon charm. It gives a glance of two powers assembled at one point. 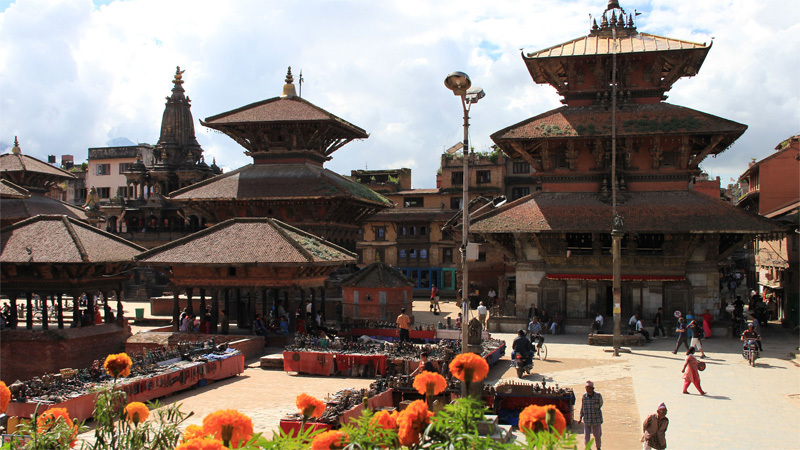 The sun represents the power of light, truth, to fight against evil. While the power of moon represents the healing power. Looking for something stunning for any party or disco nights! Here is a fancy silver choker studded with tiny diamonds to give your neck a shiny look. It also looks pretty on ethnic wear for functions. The design is widely carried by young girls or teens on casuals specially jeans. 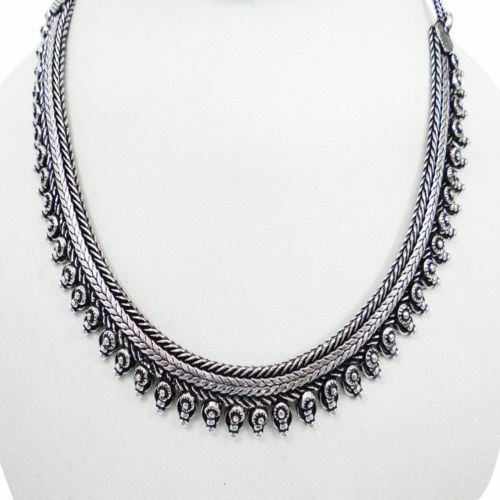 A chain style choker looks lovely to up raise your look in parties or also for regular wear. A simple gold or silver chain is attached with round giggled sky blue beads in the between. A thin chain looks amazing on casuals specially the capri to have a beach look. A big chain can be worn to add to its amazing design. Have a fantasy to wear gold coins design! Here is a choker necklace gold design to wear on functions such as engagements, pre weddings functions, etc. When carried with ethnic suits, the design of choker made with gold coin design gives an embossed look to your personality. It is also adoptable on jeans for discos. 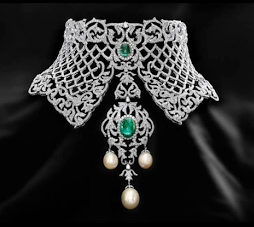 A diamond choker necklace studded with emerald and pearls give a royal look to your designer wear. 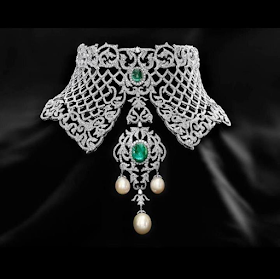 The choker design is centered with a oval emerald in green while is surrounded by tiny cz diamonds giving a lavishing look. The end of the design is made with pearls hanging below. The design gives your neck a bridal look and hence it is worn on royal wedding. Diamonds have always won the heart of the women on ethnic wear. 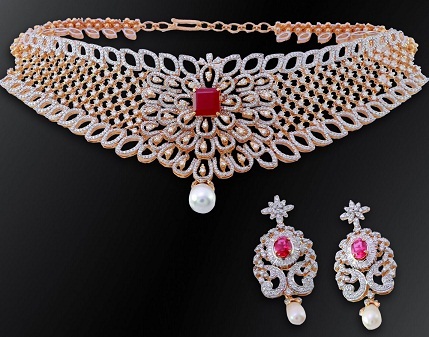 A diamond choker set design gives a magnificent look over lehengas and designer sarees. The choker is given white crystal diamonds studded with a pink emerald floral design and a set if earrings matching the design of the choker. Such sets are quite trendy these days among ladies. A pearl choker necklace gives your beauty a touch of simplicity yet fashionable. 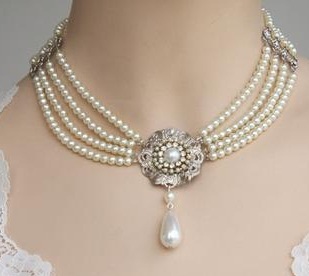 The choker design is made with four strands of sea pearls and a floral design in the middle. The flower is also given a pearl surrounded with golden design petals and a tear shape pearl hanging below. The design is carried with designer suits, sarees and lehengas to give a sophisticated look to your personality. 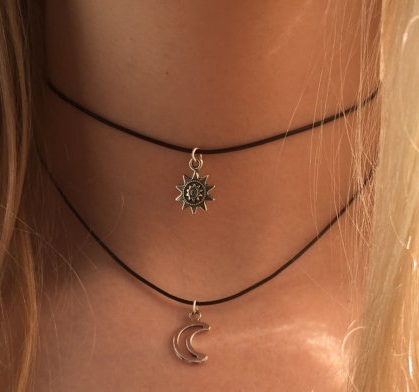 Looking for a new choker design which is funky yet trendy! 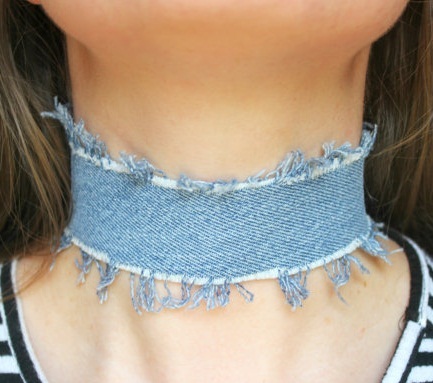 Get a look at a jeans choker made out of a piece of denim jeans. The design is quite popular among the college bugs these days. 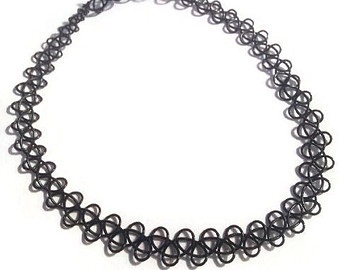 Not only the girls, but also the guys are getting a Jeans choker for a bold look. It widely is worn on casuals. A new choker necklace design getting popular is the choker having names. A personalized choker can be made with b the name of the wearer or with a word that perfectly describes her. Made from gold or silver, such choker design suits any dress whether casual or ethnic. It can be carried to offices, functions etc. A perfect gift with feeling for your angle can be a named choker. A choker design inspired by the spring or a tribal tattoo is widely funky among the youths. Not only girls but also the boys are adoption v this trend for a band look. The choker is a design with a stretchable string designed in various curves to make it more attractive. Such designs are quite often on concerts of rock stars. A quite clumsy and trendy choker design popular among the celebs is the Chanel pearl choker necklace. The choker is simple with two big pearls also known as Chanel pearls at the end of each end of the gold strand. Such choker designs are widely seen on casuals specially for models to give their designer wear an antic look. Apart from other choker necklaces, Indian choker necklace have always been studded with pearls, stones and emeralds giving an antic look every time. 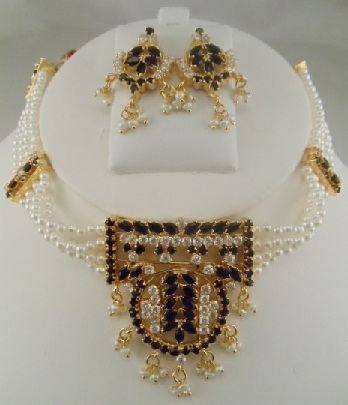 A pearl choker necklace with black stones is a unique design giving a dashing look with ethnic suits and sarees. The black and white choker also includes two matching earrings to add to its beauty. Want to wear something selected and funky! A floral design with several color combination gives a stunning look on theme parties, fashion shows, etc. for a funky look. The various flowers are made with different net material while the main strand is made with sterling silver. A simple handmade choker necklace gives a new definition to your simplified personality. The black choker necklace is made with a velvet silk material with two silver charms to add to its look. The design gives a flaunt look on casuals and black gowns. It can be made with different colors matching your dress. Not only the adults, but also the small girls adorn their neck with cute choker necklace designs. A black choker necklace is here designed with a tiny bow and two chains giving a pleasant look on short frocks or capri. 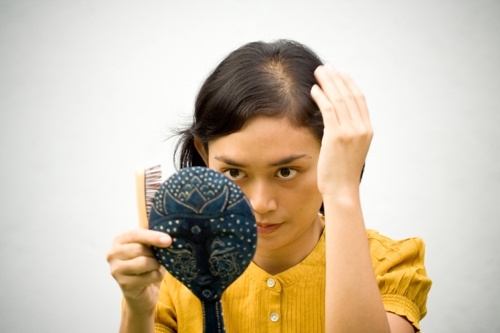 The main black strand is designed with a net material to give a gorgeous look. The design is also popular among the teen girls of colleges in kitty parties, picnic and college functions. A gold choker necklace with a butterfly design gives a lavishing look to the teens and women while it gives a cute and clumsy look to the school girls. The design can be made with a gold or silver chain. The butterfly is given a colorful stone with tiny CZ diamonds to give it a spark look. It looks amazing in discos or on casuals. Want to have a classic and traditional look for any festivals. 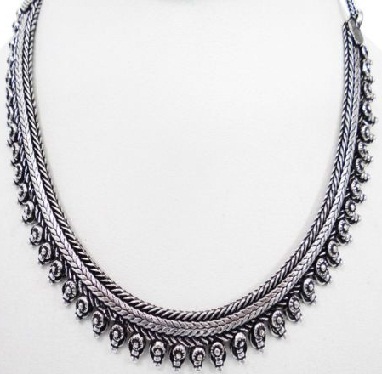 Get a oxidised choker design made with oxidised material embossed with tiny designs. Such choker designs are highly worn on Navratri, religious festive and other functions on Choli, Lehenga and traditional sarees to raise your ethnic style a step higher. 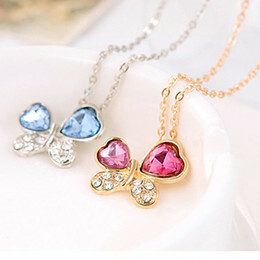 The choker necklaces are a boon to the beauties who do not want heavy necklaces for their neck. A designer choker design either hand made or made with gold, silver, diamond etc. 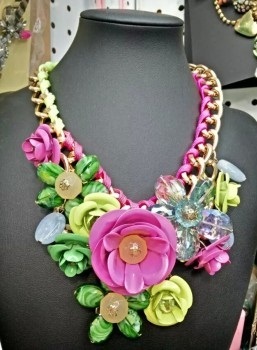 give a fabulous designer look to your neck. 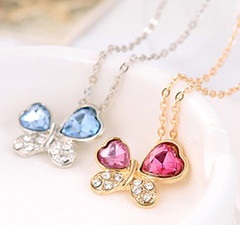 There are also several designs of choker with some specific charms made for men. They are widely carried out by the boys for a bold appearance specially for the ones in music bands, wrestlers, street dancers etc. Images Source: 1, (2- 7), 8, 9, 1o, (11-13), 14, 15, 16, 17, 18, 19, 20. 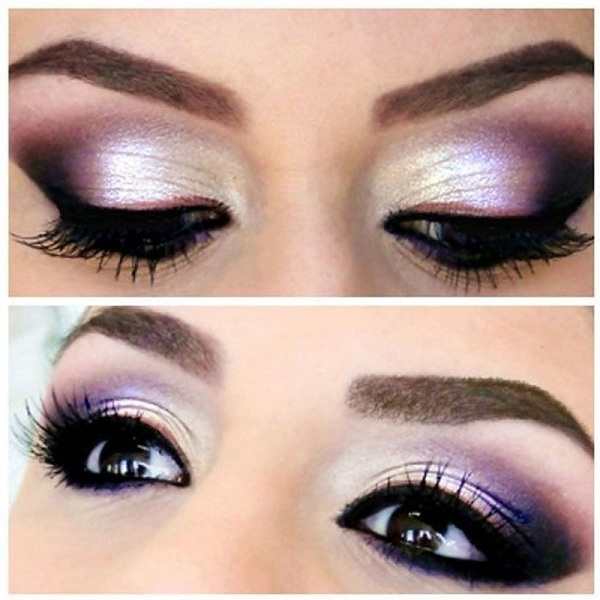 How to do Purple Eye Makeup?